Master Sgt. Benjamin A. Stevenson was born in Albany, New York on February 7th, 1975. He enlisted in the U.S. Army as an Infantryman on June 10th, 1993. After completing Initial Entry Training and Basic Airborne School, Stevenson was assigned to Delta Company, 325th Infantry Battalion Fort Bragg, N.C., where he served for three years as a Tow Gunner and Squad Leader. In the fall of 1996, Stevenson reclassified to an Aircraft Power Plant Repairer. He was then assigned to Delta Company, 82nd Aviation Battalion where he served as an aircraft power plant repairer and supervisor for 18 months. Subsequently he was assigned overseas to Katterbach, Germany, where he served two years as an aircraft power plant repairer and supervisor with Alpha Company, 601st Aviation Support Battalion. In January 2000, Stevenson attended and graduated from the United States Army John F. Kennedy Special Warfare Center and School to become a Special Forces weapons sergeant. 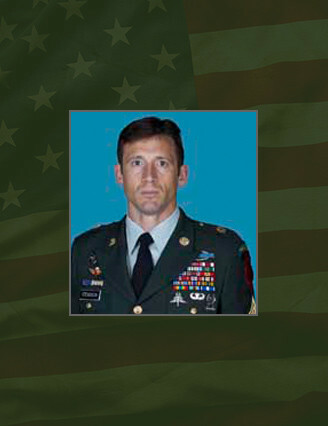 Upon graduating from the Special Forces Qualification Course, Stevenson was assigned to Bravo Company 3rd Battalion, 5th Special Forces Group Fort Campbell, Ky., where he served as a junior and senior weapons sergeant, a Special Forces intelligence sergeant, and assistant operations sergeant. While assigned to 5th Special Forces Group (Airborne), Stevenson deployed once to Afghanistan for Operation Enduring Freedom and three times to Operation Iraqi Freedom. Stevenson was assigned in May 2006 as a special operations team member, United States Army Special Operations Command (Airborne), Fort Bragg, N.C.
For five years he performed this duty, deploying four times to Operation Iraqi Freedom and twice more to Afghanistan for Operation Enduring Freedom. Stevenson’s military education includes the Heavy Anti-armor Infantryman Course, Basic Airborne School, Jungle Warfare School, Aircraft Power plant Repairer, Warrior Leader Course, Advanced Leader’s Course, Special Forces Assessment and Selection, Special Forces Qualification Course, Survival Evasion Resistance and Escape-High Risk, Russian Language Training, Air Assault School, Nuclear Biological Chemical Officer and Noncommissioned Officer Defense Course, Mountain Warfare School, Special Operations Target Interdiction Course, Javelin Gunner Course, Static Line Jumpmaster, Military Free Fall Course, Senior Leader’s Course, Special Forces Advanced Reconnaissance and Target Exploitation Course, Advanced Land Navigation Course, Department of Defense High Risk Survival Course, Military Free Fall Jumpmaster Course, and Tandem Master Course. Stevenson is a graduate of Smithson Valley High School in Spring Branch, Texas. Stevenson’s awards and decorations include the Bronze Star Medal (5th Award), Meritorious Service Medal, Joint Service Commendation Medal with Valor Device, Army Commendation Medal with Valor Device, Army Commendation Medal (2nd Award), Army Achievement Medal (5th Award), Presidential Unit Citation, Joint Meritorious Unit Award, Army Good Conduct Medal (6th Award), National Defense Service Medal (2nd Award), Kosovo Campaign Medal with Bronze Service Star, Afghanistan Campaign Medal with three campaign stars, Iraq Campaign Medal with six campaign stars, Global War on Terrorism Expeditionary Medal with Bronze Arrowhead, Global War on Terrorism Service Medal, Noncommissioned Officer Professional Development Ribbon with numeral three, Army Service Ribbon, Overseas Service Ribbon, NATO Medal, Special Forces Tab, Combat Infantryman Badge, Expert Infantryman Badge, Aviation Badge, Military Free Fall Jumpmaster Badge, Parachutist Badge, Air Assault Badge, and seven Overseas Service Bars. Stevenson was posthumously awarded the Defense Meritorious Service Medal and the Purple Heart.